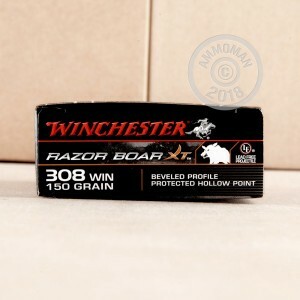 Winchester Razorback XT is specifically designed for boar hunting. The boxer primed brass cases carry a 150 grain BPPHP (Beveled Profile Protected Hollow Point) projectile. 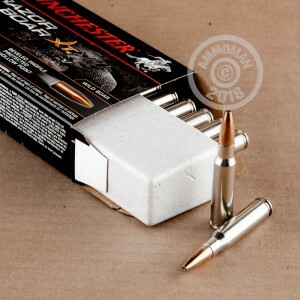 These BPPHP bullets leave the muzzle at 2,810 feet per second and are designed to penetrate through thick hide, then have deep controlled expansion. Winchester also uses flash suppressed powder in case you are hog hunting at night. 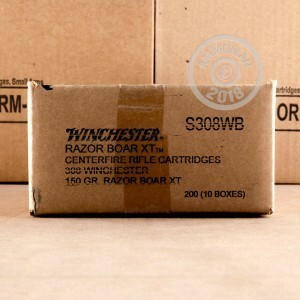 Winchester is a global leader in ammunition manufacturing. In 2013 they were the first company to produce a line of ammo specifically designed for wild hog hunting. These cartridges are loaded in the USA in Winchester's Illinois facility. Simply place an order over $99 and AmmoMan.com will pay for your shipping!